The sons and daughters of Aramcons attend schools all across the globe. While Mom and Dad might be living in Abqaiq, Dhahran, Ras Tanura or Udhailiyah, Junior and Sis are often living in some far-off land. It’s the nature of expat life in Arabia, and families embrace it as a chance for their sons and daughters to see new places and meet new people while earning meaningful degrees in noteworthy schools chosen by them for the quality of the education they provide and the character of the faculty and students. 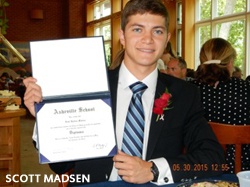 Third generation Brat, Scott Madsen, the son of Eric and Janice Madsen and grandson of Lynn followed that trend by attending Asheville School in Asheville, North Carolina where he recently graduated. Founded over 100 years ago, Asheville School provides students like Scott with a rigorous, quality education that prepares them well for life ahead. Attendees to the Asheville annuitants gathering earlier this year may remember Scott, whom Janice brought with her to some of the events. We heartily congratulate Scott on a job well done.